We are always happy to help someone in distress, and this was the opening sentence of a conversation between ourselves and a very distressed home owner in Chelmsford. Chelmsford is a London commuter town situated approximately 30 miles from London. 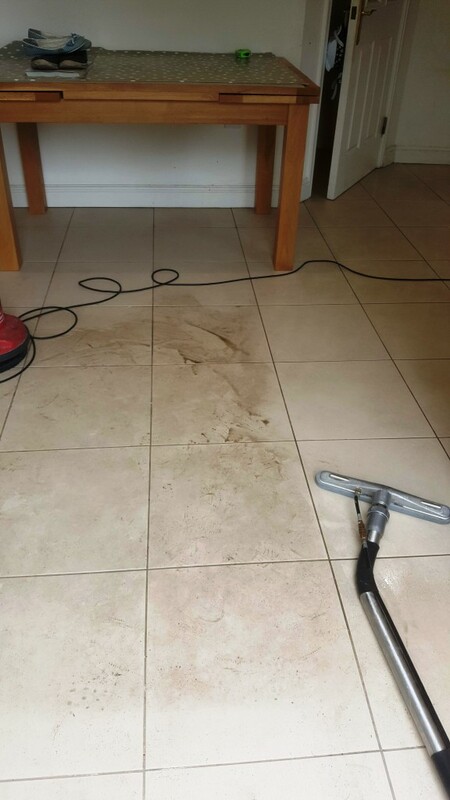 The tile in question was a Porcelain textured tile, the owners had tried to clean and maintain their floor but due to the nature of the tile, which was very textured and coupled with incorrect maintenance it had left the floor looking very dirty and unloved. We visited the property to see how we could help. The floor was across a large area in a kitchen diner so was subject to heavy usage, it had been down for some time and the new owners had inherited it from the previous owners who apparently had also had no joy in getting it clean. The floor looked very tired and in need of some attention. We discussed with the client what could be done and agreed a price for the work, booking a date for the following week. Fortunately, dirt and grease are no match for the power of Tile Doctor Pro-Clean, it’s a multi-purpose high-alkaline cleaner, stripper and degreaser that’s a very effective tile and grout cleaner. On this occasion I applied a strong dilution using two parts water and left it to soak into the tiles first. Working in areas of around 2 to 3 square meters at a time the solution was scrubbed into the floor using a rotary buffing machine fitted with a black scrubbing pad. We then rinsed the floor thoroughly with water and used a wet pick up vacuum to extract not only the dirt but also any product residue leaving the tiles clean and fresh. Apologies on only taking one photo, I usually take more but it slipped my mind on this occasion, however if you look closely it clearly shows the difference the cleaning process was making. The client was very satisfied with the work carried out, they knew the floor should have looked a lot better than it had and now it finally looked clean! Before leaving we explained how to maintain the floor and left a bottle of Tile Doctor Neutral Cleaner to keep the floor looking fresh. Tile Doctor concentrated Neutral Tile and Stone cleaner has been especially formulated for the regular cleaning of Tile and Grout.